Constraints on commercial real estate lending eased during the first half of 2010, a trend that should continue as more lenders re-enter the securitization market and life insurance companies pursue a broader range of deals. Unlike a year ago, financing has become available for properties over $10 million, and some lenders have re-engaged higher-quality, lower-risk transactions in noncore markets. In addition to greater availability of financing across property types, price ranges and markets, lenders also have increased loan-to-values (LTVs) on new loans by an average of 5 percent from last year. Despite these positive developments, potential borrowers continue to face tight underwriting standards and stringent lender requirements compared to historical standards. While commercial mortgage originations during the first quarter remained depressed relative to figures reported from 2005 to 2007, conduits and life insurance companies drove up activity 12 percent from last year. During the first half of 2010, U.S. CMBS issuance reached $2.4 billion, approaching the 2009 total of $3 billion but still just a fraction of the $197 billion annual average reported from 2005 to 2007. Even when viewed against a less frothy period, such as 2000 to 2003, activity in the first half still pales by comparison. Recent CMBS issuance included multiple-borrower deals with subordinate tranches, a far cry from the ultra-safe, single-borrower transactions completed late last year, generating optimism the sector will soon offer increased liquidity. New CMBS loans price in the 6.0 percent to 6.5 percent range for five-year mortgages, with lenders targeting deals of $10 million or more. While these interest rates may be at the higher end of the spectrum, CMBS borrowers can often negotiate 30-year repayment schedules versus an average of 25 years for life insurance companies, offsetting the impact of interest rates on monthly payments. In addition, LTVs for CMBS loans can push into the low- to mid-70 percent range, versus 65 percent to 70 percent for life insurance companies, assuming the debt-service coverage ratio (DSCR) still falls between 1.25x and 1.35x. Next to the CMBS sector, life insurance companies made some of the most impressive headway over the past 12 months. This sector increased commercial mortgage originations by 131 percent during the year ending in the first quarter and recently began to compete more intensely for high-quality deals. While maintaining strict underwriting standards, life insurance companies have begun to actively pursue new business in major markets, increasing their scope to include nearly all price ranges and property types. This demonstrates a strategic shift from last year, when most life insurance companies focused on rewriting maturing loans already in their portfolios. As 2010 progresses, life insurance companies will increase lending as their commercial/multifamily portfolios outperform the broader marketplace; as of first quarter, this segment boasted a delinquency rate of just 0.31 percent. Despite the recent delisting of Fannie Mae and Freddie Mac from the NYSE and expectations for government-mandated changes in the quarters ahead, their multifamily lending arms should remain operational, benefiting apartment investors. New loan originations by the GSEs slipped in early 2010 and may continue at depressed levels this year, however, due to a paucity of deals within their target criteria. While commercial lending will increase this year, risks to this outlook remain. High and rising delinquency rates, particularly among commercial banks and within the CMBS sector, will drag on confidence. Maturities also pose significant challenges, as declining property values have turned many owners upside down on their mortgages, making it impossible to refinance without additional equity contributions. Approximately $535 billion of commercial mortgage debt will come due between 2010 and 2011, including $110 billion of CMBS. 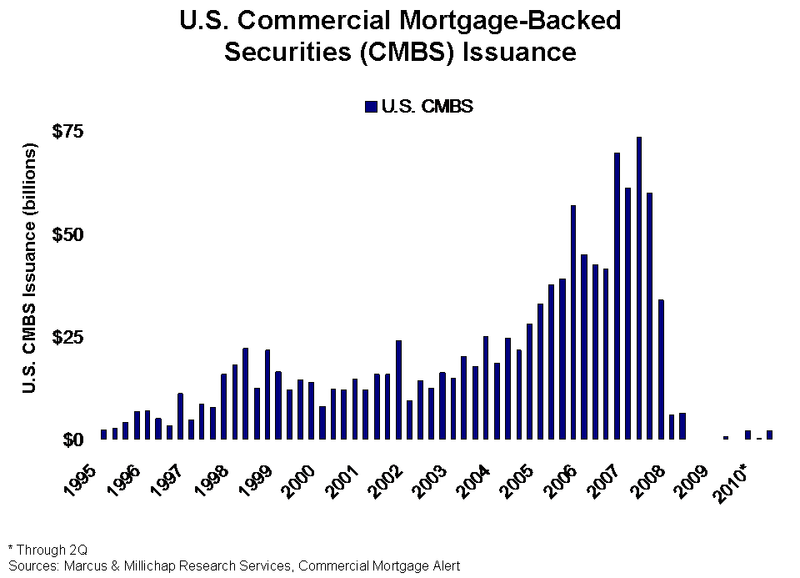 Of the CMBS loans slated for maturity during this period, more than 14.5 percent have DSCRs of 1.0x or less. This entry was written by marcusmillichap, posted on July 9, 2010 at 8:00 pm, filed under Research and tagged Capital Markets. Bookmark the permalink. Follow any comments here with the RSS feed for this post. Trackbacks are closed, but you can post a comment. topic for a long time and yours is the greatest I’ve found out so far. However, what concerning the conclusion? Are you positive concerning the source? It’s not my first time to pay a visit this site, i am browsing this website dailly and take nice information from here every day.